This recipe comes to me from my aunt who lives in Florida and hosts lots of casual cookouts and parties. This is a great dish to bring to a barbecue because it doesn’t spoil, since there’s no mayo or sour cream or any other protein/dairy in it. The marinade adds a nice tang to the crisp veggies! 1. In a saucepan over medium-high heat, bring oil, vinegar, and sugar to a boil. Reduce to a simmer, and stir until the sugar is completely dissolved. Refrigerate for one hour. 2. In a medium bowl, mix together the drained green beans, peas, corn, pimentos, celery, and onion. (I actually put my canned veggies in my colander and let them drain while I am chopping the fresh onions and celery). 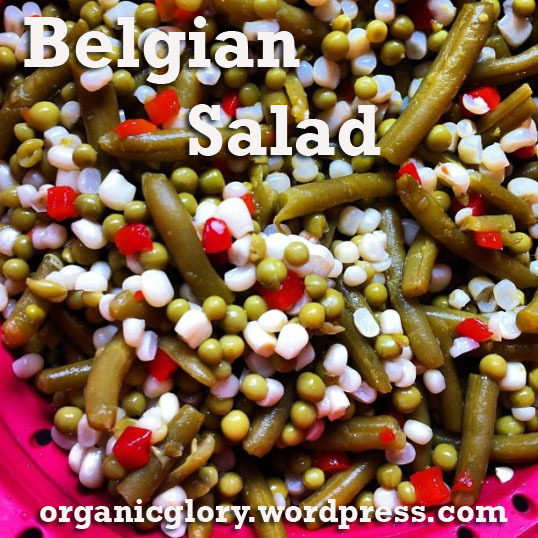 Combine them all in a big bowl then pour the dressing over the top and toss to coat. Cover and refrigerate 8 hours or overnight. Before serving, drain the marinade. Season with salt and pepper, and serve chilled. This easily feeds 10-15; double the recipe to feed a crowd of 20 or more. Enjoy! New favorite alert! 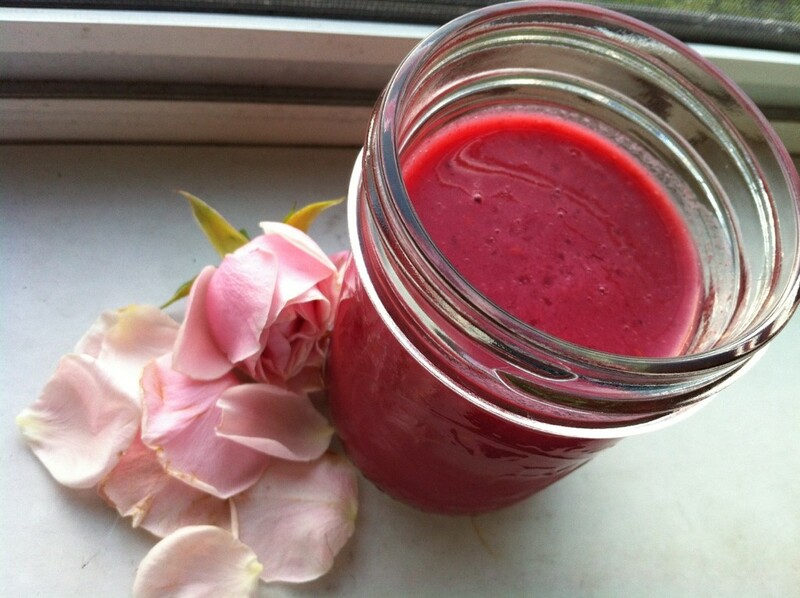 As promised in my post from last week, I’m sharing a new smoothie recipe. I made this when Mark accidentally bought cranberry juice concentrate instead of cocktail, and I love how it makes the smoothie just tart enough. I added bananas to sweeten it, fresh juice from two delicious Florida oranges I still have hanging around from our shipment in late January, and almond milk for creaminess. yumyumyum. Blend ingredients until smooth, making sure you add liquids to the blender first. It will be very tart if you use just one banana; two will make it sweeter. I used 1.5 (I always keep frozen ripe bananas, cut in half, in a baggie in the freezer so they are ready for smoothies). Add more almond milk to make the smoothie less thick. First things first: this post has a completely misleading title, because it implies you can win against severe morning sickness. You can’t, and the sooner you start seeing morning sickness as Step One in My Life Has Changed Forever Because of this Baby, the better off you’ll be. 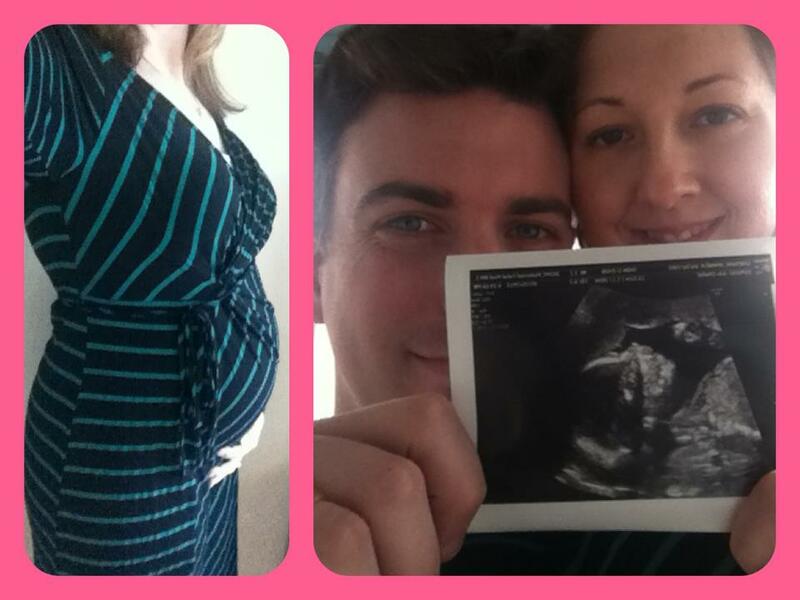 I went down in flames in my fight against morning sickness day after day for 20 weeks. When people ask how you can get through that much nausea and vomiting, I always say it becomes your new reality and you learn to cope … so that’s what this post is about. None of the pregnancy books or websites did me much help, so I decided to compile my own tips to share with you for when things get really bad. If you have ideas to contribute, by all means, leave them in the comments below. I wish I could have called this post “natural remedies for morning sickness,” but the truth is that I relied on lots of junk when things were dire, and that I was heavily medicated for more than two months just so I could go to work for 8 hours a day (if that) before sleeping for nearly 12. I’ll share several natural coping strategies for mild sick days or simple nausea, but if you get one takeaway from this post, it’ll be this: nobody gets a medal for enduring debilitating morning sickness, and you could be putting your own health and that of your baby at risk. So don’t be a hero. Just call your doctor before you end up in the hospital. (Second and third takeaway: morning sickness frequently lasts all day, and very often lingers past your first trimester, so start prepping psychologically for that by adopting a stance of acceptance now). In no particular order, here are my tips for coping with morning sickness. If a particular food stops being appealing to you, don’t try to force it. Most people who know me know that I abhor wasting food. I’ll eat boring leftovers all week just to avoid throwing away extra food, since the statistics on food waste in America are so alarming. I had to get over this. No sooner will you get home with a steaming plate of Pad Thai than realize it suddenly lives on what I call “the no-fly list.” In this case, my husband was only too eager to eat double his takeout portion, but I can’t tell you how many times this scenario repeated itself, even with foods I usually adore (like Italian) right after I’d told our friends or family a certain restaurant was safe. I had to get used to ordering something only to find it revolting when it arrived on the table, and I took home a lot of uneaten portions that Mark ate later — or not. While you’re at it, outsource the toilet bowl cleaning, cat box scooping & anything else involving chemicals to Baby Daddy, too. Not only are many conventional cleaning products unsafe to be around while pregnant (to say nothing of the hazards of cat litter), you’ll be in no mood to encounter whatever germs, smells and hair are clinging to the surfaces of your home once morning sickness strikes. And if you DO get sick and find the sink, shower or toilet in non-pristine condition, you won’t be able to stop. Don’t get sick 10 times when you could leave it at 1 or 2 just because someone doesn’t like to mop. Leave a snack next to your bed and eat it AS SOON AS you wake up, like before your feet hit the floor. And then, if you need to, just lie there for 5 or 10 minutes to let your stomach catch up. I built in time to do this every morning so I wouldn’t run late. (While you’re at it, keep some Tums on your nightstand, too). The bedside snack will also come in handy if you wake up nauseous in the middle of the night after hitting the bathroom for the second (or third, or fourth) time. Sleep on your left side. This not only quells nausea quickly, it can lessen heartburn as well. I was shocked at the difference I felt between lying on my right side versus my left. Don’t leave home without a granola bar. Or whatever your safe food seems to be. Ditto for water. Unlike when you have the flu, water may help you move past a bout of sickness due to baby, and will keep you hydrated — extremely important for your baby’s development while your body’s blood volume is doubling. Other things that worked for me: baby carrots, rice crackers, Cheerios, fruit smoothies (especially, in a pinch, these from McDonald’s), mashed potatoes, bagels and peanut butter & jelly sandwiches. Having hot water with lemon in the morning also proved extremely soothing, and I found that most drive-thrus (such as Dunkin’ Donuts) will sell this to you for 50 cents or less. What did I avoid? Unfortunately, an awful lot — my aversions were WAY stronger than my cravings. I couldn’t be around eggs of any kind, bacon, shrimp, black olives, coffee, melted cheese, pepper, the smell of booze, ground beef, sausage, Thai and Chinese food, and pretty much anything fried. I also learned to indulge the rare cravings very carefully. You might think you want a whole jar of candied jalapenos, but really one or two will suffice — and if you overdo it by one spoonful they’ll come right back up, making them immediately repulsive from that moment onward. Find the least-foamy toothpaste you can. Brushing my teeth was just insulting: the paste would make me gag, which would make me sick in the shower, which meant I had to clean the tub so my husband could use it next, AND I somehow had to get my teeth clean again without getting getting sick. My dentist had a good tip: if you really can’t take the toothpaste in the a.m., which I truly couldn’t for a few weeks there, just brush as best you can at night, and then brush with a bare toothbrush after rinsing with a good mouthwash in the morning. And don’t forget to floss, even if your gums are bleeding for the first time in your life thanks to all those hormones. You can really develop some serious problems if you don’t take care of your teeth while you’re pregnant. Don’t take your prenatal on an empty stomach. If you are having trouble getting it down at all — either because it makes you nauseous when it hits your stomach, or because the act of swallowing a pill makes you gag — talk to your doctor about other options. When I had gone almost a week without being able to get mine down (or keep it there), I got the green light to switch to these chewables, available at Target or online via Amazon. Graze, don’t stuff. 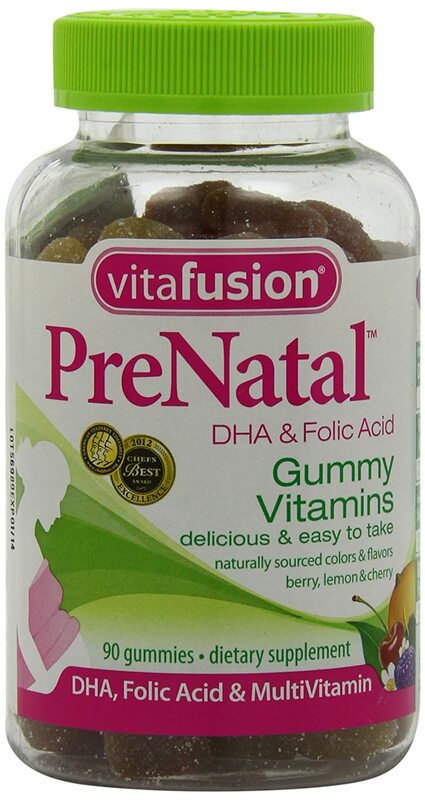 Not only will you be shocked at how full “full” really feels when you’re newly pregnant, over-eating will make you nauseous and potentially cause you to vomit too … and all you can do is wait for digestion to take its course, barf bag in hand. (Related tip: if you’re getting in the car or going on the subway, don’t leave home without packing a barf bag in your purse. They actually make stylish ones, believe it or not). If something works — for example, waffles for breakfast, lunch & dinner — just go with it. I found things with sugar helped stabilize me so I could at least leave the house (canned fruit, cranberry juice, waffles with maple syrup, etc.) but I’ve heard just as many people say sugary things made their nausea worse. Personally, the usual upset-tummy trio of toast, peppermint tea and ginger candies made me MORE sick while pregnant, so don’t be surprised if your go-to cures feel like the opposite as well. There’s no right or wrong (unless you’re thinking Brie, white wine and espresso are your go-to remedies). I plan on doing a post soon about my top maternity wear recommendations, since it can be so challenging to find a) petite preggo wear and b) work-appropriate attire that’s fashionable, professional and comfortable. PS: Need a laugh? When all else fails, visit the PregnantHusband Tumblr blog and I promise you, your day will improve. (Not that it can go downhill much when you start with your head hanging in a toilet). Final words of wisdom: Your baby will be fine no matter how much (or how little) you are eating. My typical day included a bagel in the morning, a bag of Cheerios that I nibbled on all day, ginger ale or lemon water in my hand at all times, and mac n’ cheese or soup and toast for dinner. If I could muster it, I ate an apple and a granola bar for a snack. It was seriously lame and nutrient-deficient. But you know what? You can make up for the lack of vegetables, iron, legumes and Omega-3’s later in your pregnancy. Don’t worry if you can’t fit in much exercise, either. You can get back on board with physical activity after your morning sickness fades, so just take care of yourself and get lots of rest in the meantime! Baking a baby is hard work, and there’s no shame in getting the rest you need. And click here for a helpful prenatal wellness & nutrition guide from the hospital where I’m delivering in Boston. How can I forget Tasha? Click the photo to see how she is coping with the news. I have found it! The ultimate on-the-go smoothie container. 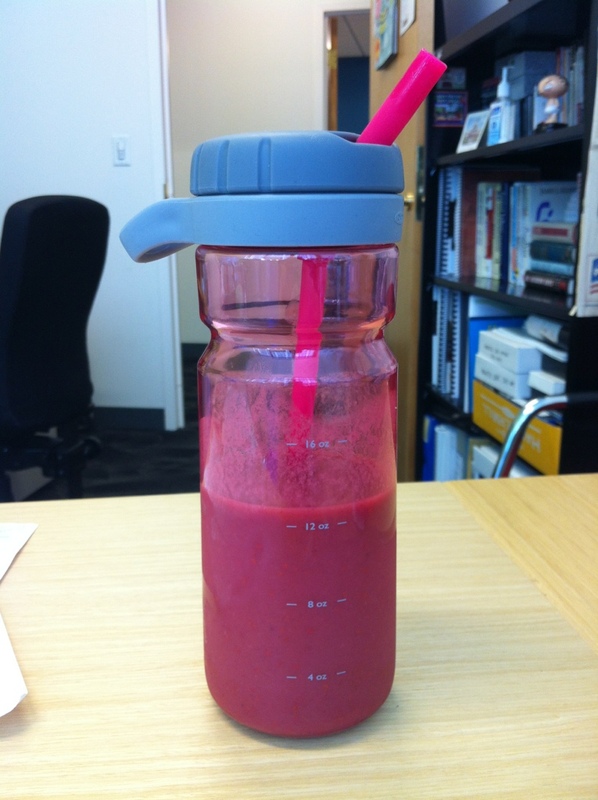 Being tested with an actual smoothie, in my office. 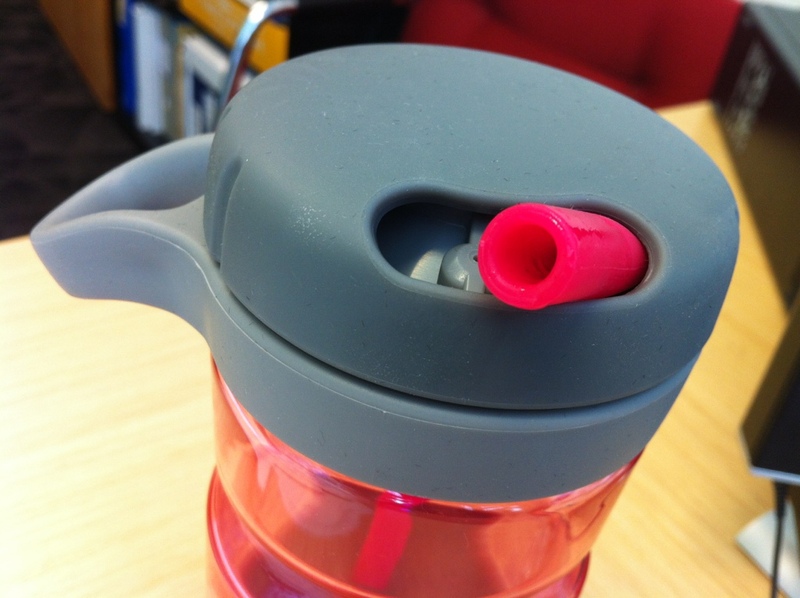 I’ve been searching for something for years that would do several key things: 1) Keep my smoothie cold; 2) Provide a straw for drinking; 3) Lock so it doesn’t spill when it’s in my purse; and 4) Be BPA- and PVC- free. Thanks to TJ Maxx, I’ve finally got it — and for just $7.99! 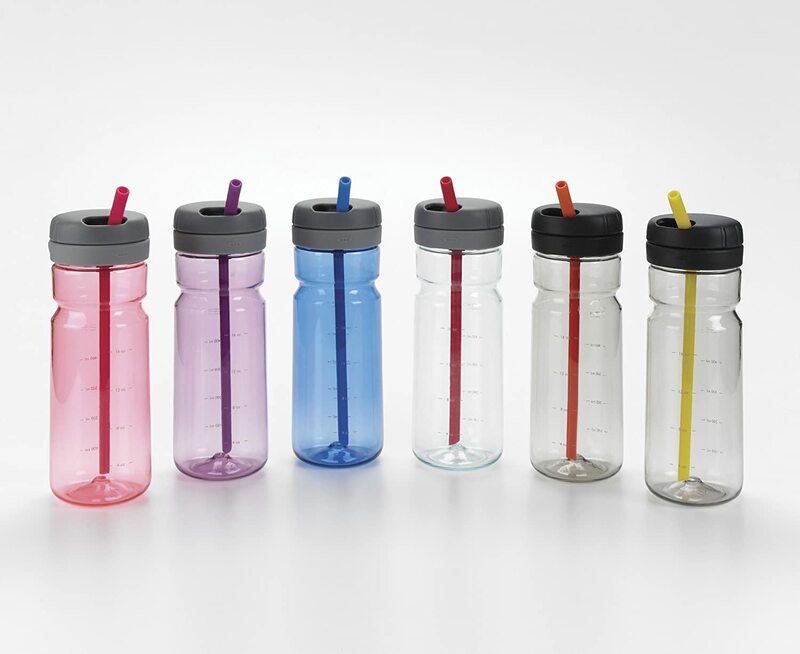 The straw is retractable, so you simply twist the lid and it locks the bottle with the flexible straw inside the lid. You can also take it apart easily to clean it, so there’s no junk left inside the cap or stuck in the middle of the straw. Here it is locked! I tested it in my purse, and it is completely spill-free. Most importantly, this container is large enough (24 oz.) 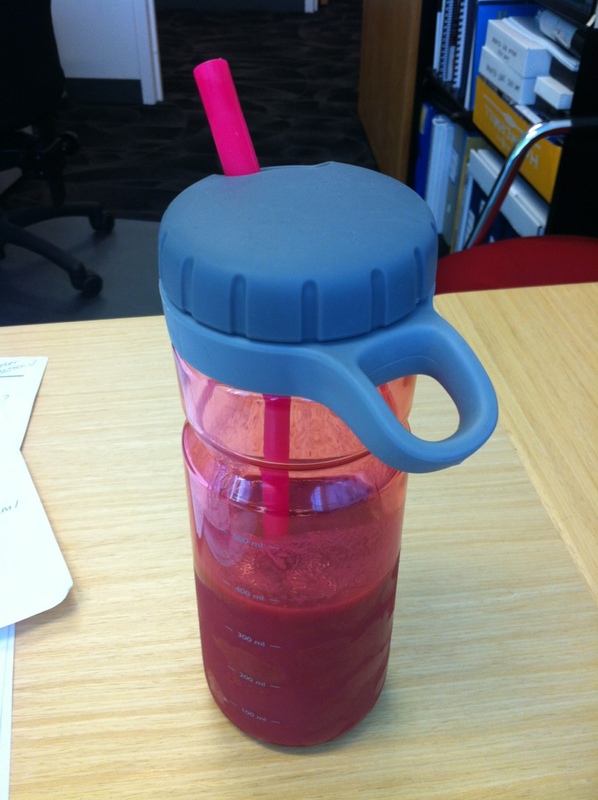 to hold a meal-sized smoothie, and the straw is wide enough to drink a thick liquid through. 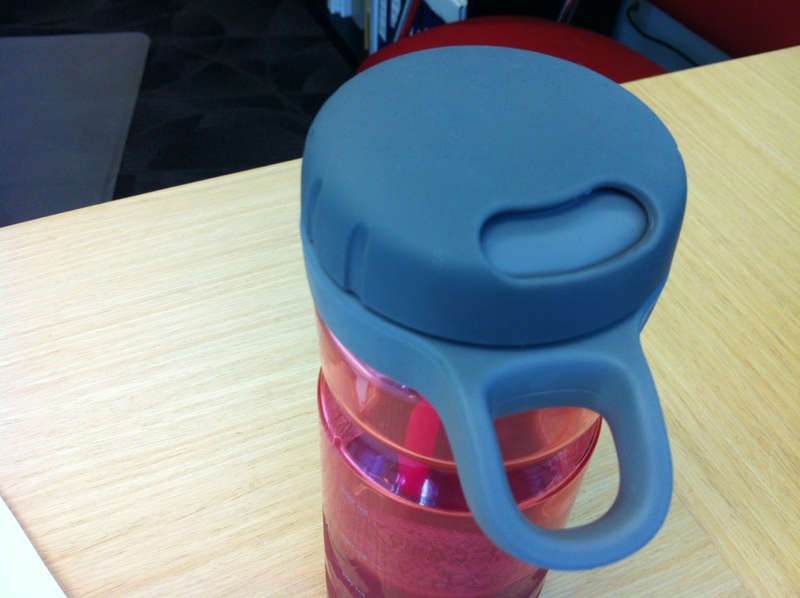 In the past, I’ve used stainless steel containers like this one from LL Bean, which is good for keeping things cold, but is inconvenient to drink with one hand, which rules out the subway or anywhere you just don’t have somewhere to put down a drippy lid (like a meeting, or the doctor’s office). And you have to either forgo a straw or remember to pack a disposable one, which is wasteful. And don’t get me started on how these wider-mouth mugs leave a spot of smoothie on your nose when you sip. This one solves the disposable straw problem, and the lid issue. Everything else I looked at that had a straw had no way of closing it off from leaks. This popular option is cool, but isn’t very portable. Now I can take my smoothie everywhere! Can you tell I’m excited about this?? If you want to get one and can’t find it at TJ Maxx, they seem to be available on Amazon for $11 in three sizes and several different colors. I am very particular about drink containers (as with most things), so if you are, too, then I hope this fills a niche for you 🙂 And no, Oxo isn’t sponsoring this post, I really am this excited about a travel mug. Click the picture above to buy in whatever color you like best. And stay tuned, because I’ll have a new smoothie recipe coming later this week! Still need ideas for Mom’s brunch or supper this Sunday? I’ve compiled a round-up of things I’ve made in the past that went over well. From breakfast and brunch dishes to salads and desserts, these options should give you lots of ideas. Treat your Mom well! Just like the Americanization of the holiday itself, these recipes are only marginally authentic — but man, are they festive. Cue the mariachi music and host your own fiesta! Heat the oil in a pan over medium heat.Add the onions and saute until tender, about 5-7 minutes.Add the garlic, cumin, chipotle chili powder, and jalapeno saute until fragrant, about a minute.Add the tomatoes, black beans, oregano, salt and pepper and bring to a boil.Reduce heat and simmer until the sauce thickens, about 20 minutes.Remove from heat and stir in the cilantro.Place half of the mixture into one or more baking dishes, top with the eggs and spoon the remaining mixture around the eggs.Bake in a preheated 350F oven until the eggs just start to set, about 5-8 minutes.Top with the cheese and broil until it melts, no more than a minute or so. For the tortilla chips: cut a stack of corn or flour tortillas into wedges (I used 8-inch rounds, and cut up about four of them) and brush with olive oil. 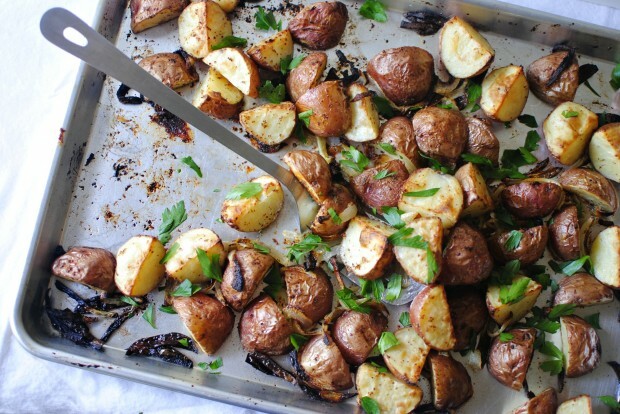 Spread on a baking sheet, sprinkle with kosher salt and a squeeze of fresh lime (you could also add cumin), and bake at 350 for 7-8 minutes. Turn the pan around in the oven and give the chips a stir, then put the pan back in for just a couple more minutes until they are crisp but not burned. Let them cool briefly before serving. Start by preheating the oven to 375. Prepare the spinach (thaw, rinse and squeeze dry), and set aside. Next, melt the butter in a saucepan over medium heat. Add the onion and then the garlic (so it doesn’t burn), cooking until fragrant but not browned. Stir in the spinach. Cook for 5-7 minutes, stirring, then remove from heat. Mix in the ricotta cheese, sour cream, and half the monterey jack cheese. Repeat, laying each enchilada side by side until the dish is filled. Pour the remaining enchilada sauce on top, spooning it evenly over each tortilla and making sure it gets down in between the seams to nothing sticks while cooking. Sprinkle the remaining monterey jack on top of the enchiladas. Bake for 20 minutes or until the cheese is melted and the whole thing looks browned and bubbly. Serve with sour cream, guacamole, rice … you name it! Spread the salt out onto a small dish. Dip the rims of 4 margarita glasses in water and then dip them into the salt.Into a blender, add the ice, lime juice, orange juice, mango nectar, and 4 shots of tequila, if desired. Blend until smooth. Pour into the prepared glasses and garnish with a lime wedge.